Christmas is starting to be a distant memory but thankfully some of it gets to stay with us a few weeks longer. The tree is always put away on January 6th (although ours literally came down on Christmas Day when the old tree collapsed - but that’s another story! ), and of course there are the presents. It was getting a really simple present this Christmas gone that reminded me of just how inexpensive life’s great pleasures can be. 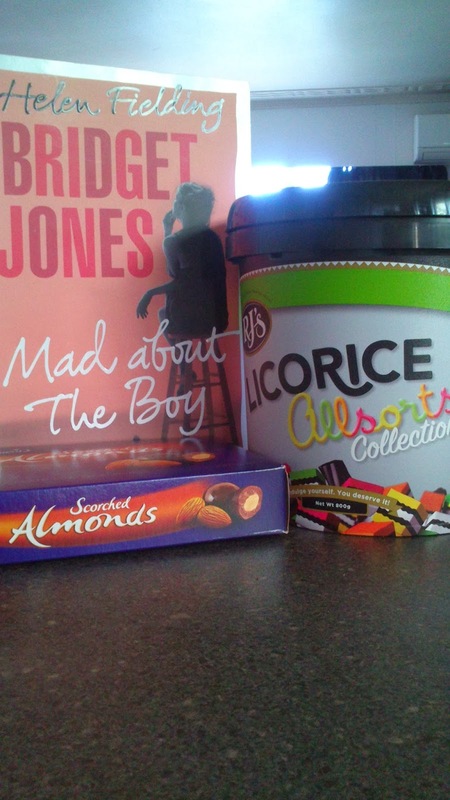 I‘d been in a bookshop the week before and randomly picked up the new Bridget Jones novel. I own both the movies on DVD and have seen them many, many times and I think, somewhere, I might even have the soundtrack on CD. But I admit… I’d never read the books. I think it’s because I missed them when they first came out and sometimes reading a book after watching the movie just doesn’t work. But I’d heard good things about the new story in spite of the – you know – the terrible thing that happens – so I was intrigued. I read the first few pages in the store and knew that this year, buying me a Christmas present was going to be dead easy for the kids. The only thing I wanted was to read that book. I took a photo of it to Tweet and thought, you know, it’s a perfect gift - confectionary and a can’t-put-down book. It is indeed a very simple pleasure - and books are so much nicer when you get to unwrap them, don’t you think? So I got to thinking about other simple presents I’ve loved. There was a book about the staff at a library who adopted a cat they called Dewey. A cheap (I know it was cheap because my son told me the price, it was so amazing) china mug with a lid so I can have a coffee at my desk at work – I use it every day and people still compliment it. And of course, one can never go wrong with favourite chocolates and lollies. So please share. What simple or cheap gifts have you received in the past that have brought you a lot of joy? Birthday, Christmas – maybe, given we’re romance readers here, even a Valentine’s Day gift? Joanne, books give such great value for so little money ... especially when a read hits the spot, the way your Christmas gift did! For favorite little gifts of my own, items from my two kids would have to top the list. When they were small, Dad would take them shopping, and they'd pick out a little pin for me. Now that they're teens, they still don't have their own income, but they'll steer my hubby toward a CD they know I've been craving. And music is another terrific way to give long-term enjoyment. I remember the Christmas that money was extremely tight, and my husband and I decided to give only inexpensive gifts. At a yard sale, he bought a wooden salad bowl set (large serving bowl and four individual bowls), sanded and refinished them...they were absolutely beautiful! A couple of decades later, when I was getting ready for the big auction of most of our things, my son and his fiancee decided those bowls were something they'd like to have. So I was able to give them the bowls, and share the story. It still makes me cry. That's such a moving story. Thank you for sharing it! I've not read any of the Bridget Jones books either, but you've got me interested now. I'll have to pick up the last one. I often end up choosing and buying my own presents from family at Christmas. I even have to wrap them up as well sometimes! One of my favorite presents this year was a scented candle that I light when I'm writing. It gives me the fragrance of Christmas. I hope it lasts for a few more weeks. It is so difficult to buy friends and family gifts in this day and age when people have everything they want. Small gifts are often the most cherished if some careful thought has gone into them. I wonder if a lot of writers are relatively "frugal" (for want of a better word, although the word itself sounds kind of nasty and miserly, don't you think?) and enjoy the simple things is because.. well, we have to be at times. Enjoyed your comments, ladies! In my family we enjoy making gifts for each other. With so many of us exchanging, frugal is key! My daughter made us mugs with a cute individualized saying on each one, and the younger daughter made beef jerky and ginger beer. Talk about yum! I think the little gifts are often the best! I'm thinking of some of the touching gifts I received from my children ... the ones I didn't buy myself, but that they surprised me with - like the handmade birthday cards I got recently. Since they're teenagers, I hadn't got any of those in years, so definitely unexpected! And a spice cake my 14-year-old baked for me. It's long gone, but the taste will last forever :) It doesn't take very much to show someone you love them. Love the idea of cute mugs, Aileen, and the spice cake, Milou. Cooking for someone is really special!